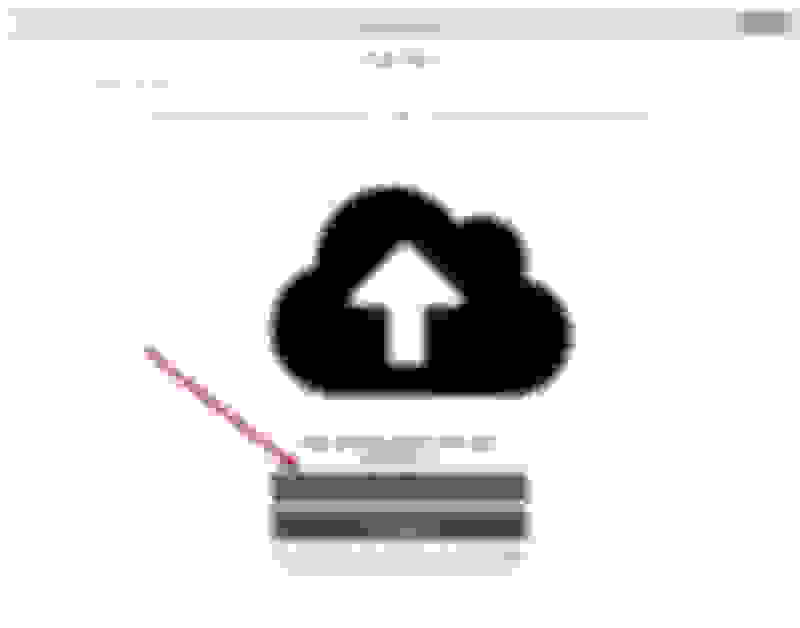 Recent upgrades to the site allow files to be posted via the Paper Clip (Attachments) icon (pictured below). 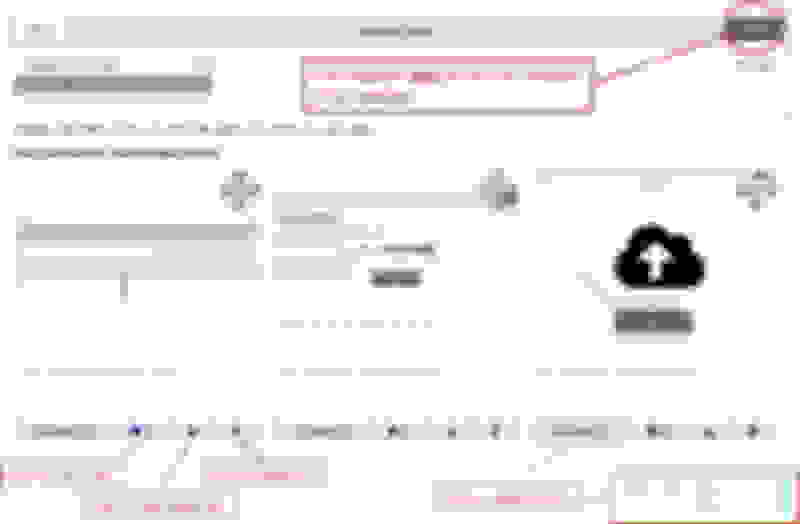 You may or you may not see the Paper Clip icon depending on whether you are viewing this site from a hand-held device in 'View Full Website', 'View Mobile Site' mode, or using the 'Go Advanced' feature. The following instructions apply to both icons. To UPLOAD a image/picture, click on one of the icons identified below. 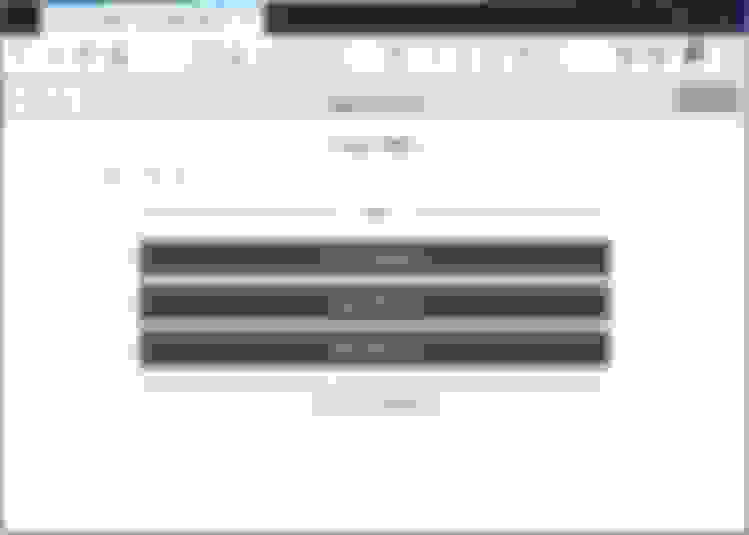 The screen you see next depends on whether you are uploading from a mobile/hand-held device, laptop, notebook, or similar small-screen device or a large-screen desktop PC. From a desktop PC you will not see TAKE PHOTO. From URL means a website address (link) where you have picture/image files stored in a different location (not located on www.classicoldsmobile.com). In other words (as an example), your image file(s) are hosted at Photobucket, Flickr, Dropbox, Tinypic, Imgur, GooglePhotos, or another website. 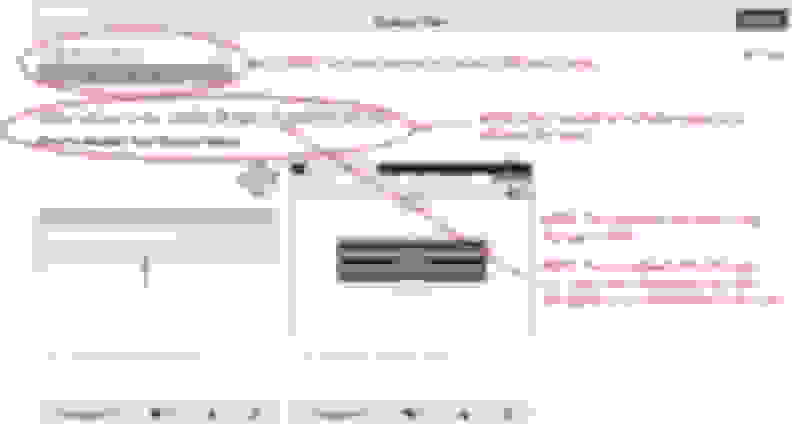 Copy/Paste the URL website address location of the picture/image file into the box Paste a File URL... NOTE: The URL must contain the actual picture/image file e.g. .jpg, .jpeg, etc. From Device means your picture/image file is located on the mobile hand-held device, laptop, notebook, or PC you are using. This will apply to most CO (Classic Oldsmobile) users. Take Photo means the image you'll upload comes from a photo you are about to take on your hand-held device. Generally you'll see/choose Use Photo from your hand-held device (after you've taken the photo), the statement you see might be different depending on the type of hand-held device you are using. 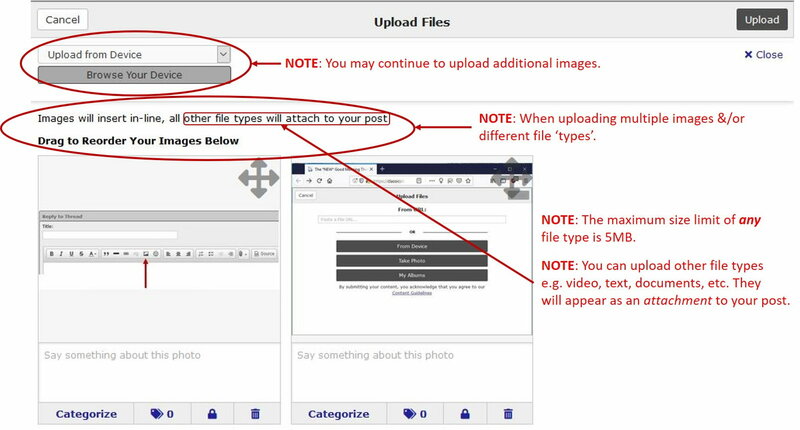 The process to Upload that photo remains the same as depicted in the instructions which follow (below). My Albums means you have previously created Albums in your CO profile on www.classicoldsmobile.com and you have image/picture files located in an album. As an example, you have chosen the Browse Your Device button (pictured below). The Upload Files window appears (below). Read each NOTE: to familiarize yourself with the various operations. Select the files you want to upload - you may select multiple files (both image files and 'other' file types). IMPORTANT: All select files must appear in the following window (below) before you click Upload. Wait until your file(s) are viewable in this window (below) before clicking Upload (see following instructions). Next, click Upload only after all files are viewable in the following window (below). Ensure your images are arranged in-line in the order you want them viewed, add tags, categorize, and/or delete any files, etc. After clicking Upload, you will be returned to your post page where you can save and/or preview your changes. Click either Save Changes (without previewing), or click Preview Changes to view your files. IMPORTANT: If you choose to Preview Changes, you must return & click Save Changes in order for your files to be saved. Congratulations! You have successfully posted images. For additional information pertaining to editing images & making changes to your post, continue to read the next post Advanced Features & Editing Posts. Last edited by Vintage Chief; February 2nd, 2019 at 05:22 AM. The Go Advanced feature provides the ability to edit a post (e.g. images, attachments, messages, options, etc.). There are several places to find the Go Advanced feature button. A file extension identifies the file format. It is a group of letters (suffix) which occurs after the period in a file name. Examples of file (name) extensions: .JPG, .JPEG, .PDF, .MP4, .BMP, .TIFF, .TXT, .GIF, etc. .JPEG and .JPG are the recommended image file formats for websites. Images/Attachments/Files must be one of the file extensions identified below. The Manage Attachments button (identified below) is available via the Go Advanced feature. 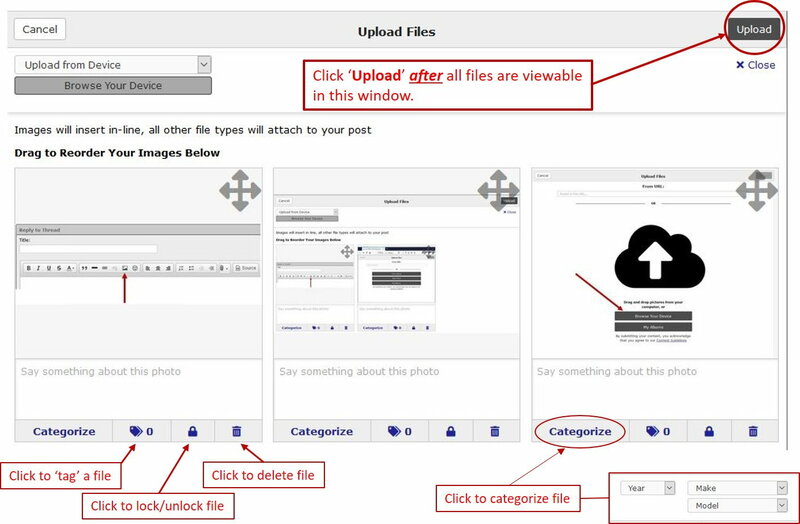 The Manage Attachments button provides the ability to rapidly return to the Upload Files window. Selecting the Manage Attachments button (identified above) returns the user to the familiar Upload Files window (below). Last edited by Vintage Chief; February 1st, 2019 at 06:03 AM. I made this a sticky, thank you Norm for all the work you put into this. Great job Norm. Since these questions come up about once a month, your sticky will save a lot of people a lot of time. Last edited by Vintage Chief; February 1st, 2019 at 06:44 AM. Since these questions come up about once a month, your sticky will save a lot of people a lot of time. How much you want to bet it won't? There have been photo-posting stickies on this site since the beginning, and people still ask how to post photos. Norm's current effort to educate people is probably the best so far, but I wouldn't assume that this will be the end it. TH400 - NEW IMAGES ?? ?